We are proud to announce that BLAZIN OCCASION, a 2004 Gelding (BLAZING HOT – MAGICAL OCCASION , by CLASSIC OCCASION) owned by HEATHER VANHOOSER and shown by HEATHER VANHOOSER was 7th at the 2012 All American Congress in the Novice Amateur Western Riding. We are proud to announce that SHE LOOKS EXPENSIVE, a 2007 Mare (BLAZING HOT – ELEGANT INVITATION , by INVITATION ONLY) owned by BRAD & CORRINE BORTON and shown by COURTNEY BORTON AMENT was 4th at the 2012 All American Congress in the Amateur Western Pleasure. 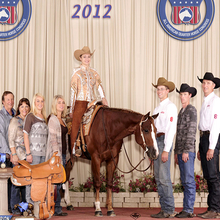 2012 All American Congress – TROUBLES A BLAZIN Champion Novice Amateur Western Riding & More! We are proud to announce that BLAZING HOT COOKIES, a 2004 Mare (BLAZING HOT – COOKIE LEAGUER , by ZIPS CHOCOLATE CHIP) owned by BILL & CINDY COSENTINO and shown by BILL COSENTINO was 10th at the 2012 All American Congress in the Amateur Western Pleasure.